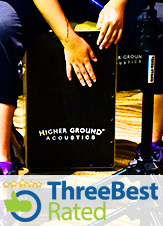 Level IV takes you to a higher level of expression and impact on the Cajon. This module will focus on sharpening your playing execution while developing within you a keen sense of rhythm application for various songs. The in-class approach to rhythm exercises will help you master steady hand coordination to incorporate the use of complimentary percussive instruments. iii) Wish to relearn the fundamentals of playing hand drums especially for rhythmic feel. This will help you to develop your playing further. You will be equipped to understand fundamental music theory for reading musical scores. This will eventually lead to documenting your very own rhythmic patterns. Playing along with the backing tracks every week will offer essential experience of playing in a band, while developing a firm rhythmic feel along with a consistent tempo.